In a double-header on March 10th 2012, CCR hosted two leagues from the North of the UK and both bouts saw CCR battle tirelessly to the finish. 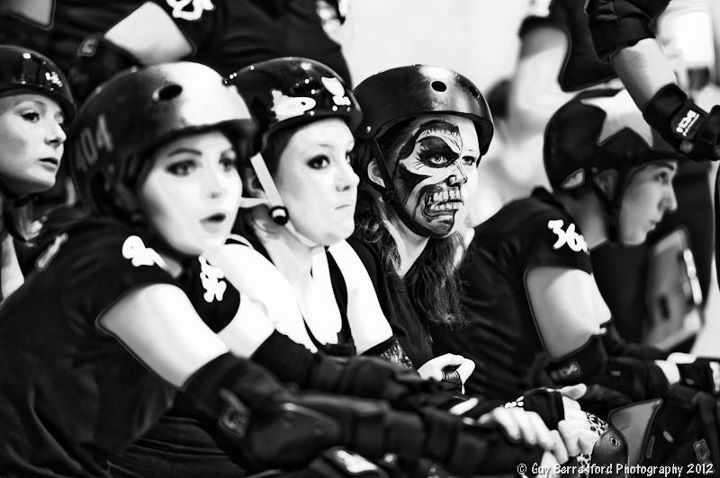 The league’s Slay Belles met with Manchester Roller Derby one year on from beating them in Manchester in a closely-fought game and this bout was no different – with both sides pushing hard and fast to try for victory. CCR had a rabble of fresh faces on the squad, mixed in with seasoned Slays, and the new line-up saw some impressive tight walls, offensive plays and some tenacious jamming. MRD took the lead in the first jam and called it off after scoring 5 points, and CCR caught up in the third jam. With jammers from both teams doing a Fun-House style swap in the box, both teams had powerjams to exploit in the first half and CCR crept into the lead with 49-40. MRD used a knee start after CCR’s jammer was sent to the box again and clawed the lead back 59-63. Despite some big hits and valiant pack work by CCR’s blockers, and both teams drawing level at 99-99 in the second half, MRD kept their cool to run out winners by 135 – 123.